Import EML files in Outlook 2016 including all attachments and images with the help of EML to Outlook importer. The EML to PST Tool also provides free Demo edition for the user to import 10 EML file into Outlook 2016 at free of cost. 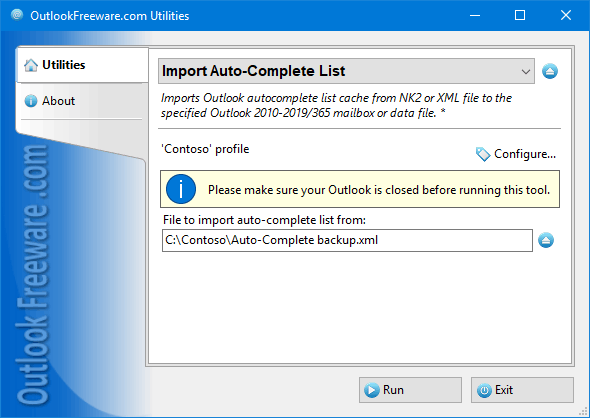 Free, easy and fast way to import Microsoft Outlook 2010/2013/2016 auto-complete list cache into selected mailbox or data file from XML, NK2 or DAT format files. Provides Outlook add-in and standalone windows launcher application. Zimbra import Mailbox TGZ into Outlook PST with Zimbra to Outlook Convert Tool. This tool smartly converts Zimbra Mailbox into .pst format with all emails, contacts calendars, tasks etc. All versions of windows Mail app are acceptable by the software to import messages from windows Mail to Thunderbird. The tool is capable to import configured as well as non-configured emails into Thunderbird. To Import MBOX Mail to PDF, use them MBOX to PDF Tool that is simple utility to perfectly Import MBOX Mail to PDF with attachments on windows Machine. It works smoothly and provides complete migration outcome.